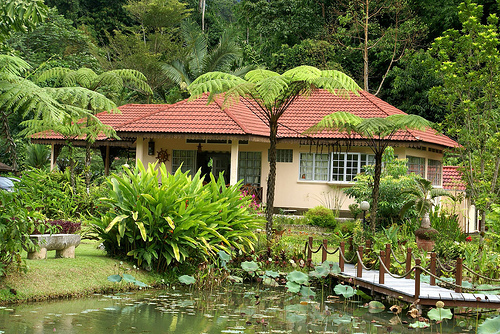 Janda Baik is a village in Colonial Malay reserve Bentong, Pahang, Malaysia. It is located on the slopes of the Banjaran Titiwangsa, about 600 meters above sea level. Tourists often come to Janda Baik, because it is a Malay village in the highland plains, and the air was cool and the atmosphere is always comfortable. It's full of flowers and native plants. 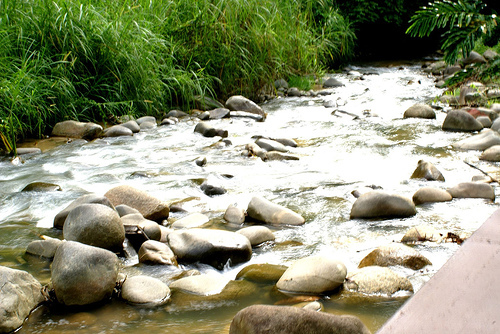 There are many streams flowing through the village, making it ideal for picnics and camping. We have this great place, 600 metres above sea level, along the famous Titiwangsa Mountain Range of Malaysia. Our place is always cool and fresh. It is set right in the middle of the tropical jungle. We never cease to marvel at the rich flora and fauna while enjoying the natural sound and the refreshing scent of the jungle in the beautiful landscape of the place. This is where we take frequent refuge from the hustle and bustle of city life. It is indeed a place where one can live in a virtual world created only by the richness of one's own imagination. We built our vacation home here which we name "Sailor's Rest". 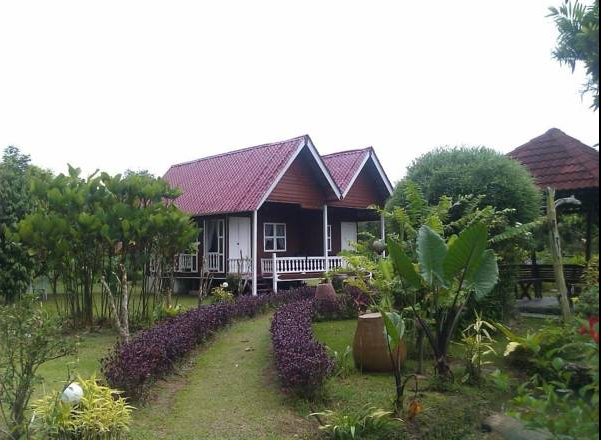 What we have at Sailor's Rest are a three-bedroom main house with a one-room annex, a houseboat, three fish ponds, a river, an orchard and a beautifully designed garden. The whole place is designed to provide complete relaxation.We love to have guests with us to share the tranquility and the serenity of the place. I am sure you too will enjoy Sailor's Rest just as much as we do.For your next vacation, do come and stay with us. It will be a total breakaway vacation for you. We look forward to having you on board. At Sailor's Rest you can be assured of fair winds and following seas always. Set 600 meters above sea level along the Titiwangsa Mountain Range, Sailor's Rest offers an escape from the city with accommodation set in a tropical jungle. Free WI-Fi is available. Nestled in the high plateau of Janda Baik, Sailor's Rest is only 45km from Kuala Lumpur, 25km from the exotic Genting Highlands and 22km from Bukit Tinggi Resorts. It is really within easy reach to the three great happening centers of Malaysia. From Kuala Lumpur take a leisurely drive along the Karak highway, the most scenic highway in Malaysia. Leaving the highway at exit 803 through Genting Sempah, the journey takes you along the country road that brings you through thick tropical jungle and some quaint Malay villages. Make this drive a memorable one by savoring the rustic beauty of the changing scenery as the road winds its way up to Sailor's Rest.Sailor's Rest is situated at the confluence of two rivers Kuali River to the North and Lurah River to the South. The rivers are fast flowing but shallow with cool crystal clear water. 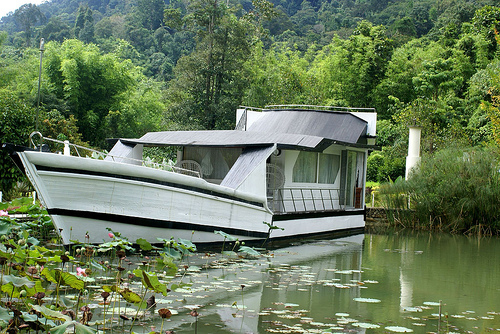 Situated at the merger of the Kuali River and Lurah River, Sailor's Rest is only 25 km from exotic Genting Highlands. Bukit Tinggi Resorts is 22 km away, while Kuala Lumpur is 45 km from the property. The main house is built with the concept of maximum light and maximum air. It is on the bank of Lurah River which provides a therapeutic sound of flowing water on one side and the beautifully designed garden on the other. Lazing on the balcony overlooking the garden, which is set against the hills and mountains, the view is a sight to behold. All these and the shzzzz sound of the river, the distant chirping of the birds and the high pitch monotones of the insects will seduce you into a complete relaxation. 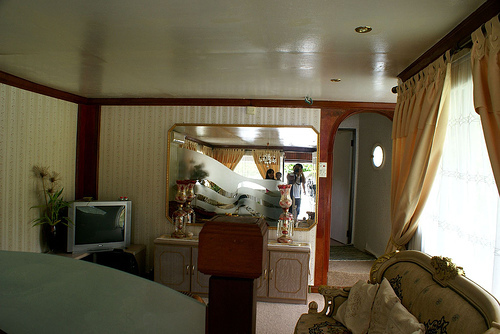 The houseboat is built on the pond made especially for the purpose. The 160 square meters of deck provides ample space for forecastle, poop deck and living areas. The living area is complete with cabin, pantry, washroom and heads. It is luxuriously furnished and pleasingly decorated. The boat is berthed alongside a wharf in a make-belief harbor. To add reality to the whole maritime scheme of things, a light house is erected at "Bluff Point". No booking fees. You only pay the hotel. Booking.com will never charge your credit card.